We use a professional grade cabinet paint to produce exceptional results for you. We recently made a paint change at 2 Cabinet Girls. We had switched from Benjamin Moore Advance paint to McCormick Paints’ Interlok formula a few years ago. When McCormick closed down their local store here we were approached by a specialty paint store that caters to professional painting contractors. We are now using a formulation that isn’t available to retail customers to give our customers even better results. No matter what paint we use you are never limited to a specific brand’s paint color. We can mix any color from any brand you choose. This paint creates a smooth and luxurious finish that doesn’t show brush or roller marks and also stands up to the toughest wear and tear. Perfect for kitchen and bath cabinets. This is why professionals use this paint for giving cabinets a furniture-like finish. It’s available in low-sheens (like eggshell and satin) to a glossier high-sheen. 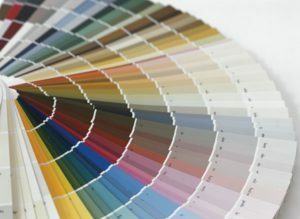 We know that choosing a paint color can be overwhelming, so we’d be happy to provide you with help in making your selection.